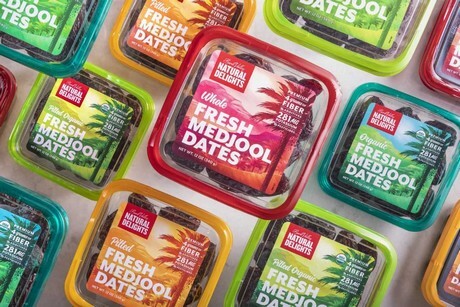 Natural Delights® has presented the next evolution in the Medjool date category with a new label design for its lineup of Medjool date products. According to the company, the new look is a result of a year-long research and development process aimed at creating a packaging design that was reflective of the brand’s sales growth among with healthy, active Millennials and young moms. “As we brought new shoppers into the category through our consumer marketing programs we needed to harmonize the brand’s in-store presence with our outward facing consumer communications and support the distinct needs of our new audience. Thanks to our work over the last two years, the Natural Delights® brand now represents 88 percent of the entire Medjool date category is enjoying a 31 percent YOY increase in unit sales velocity,” said Erin Hanagan-Muths, Director of Marketing, Bard Valley Date Growers. Natural Delights® partnered with Nielsen to identify the best performing label graphics and on pack messaging. The new design features illustrations representing Bard Valley, California with different color variations. “Not only is our new look beautiful, but it’s backed by powerful research. Nielsen helped us optimize every detail of our on-pack messaging and reaffirmed that statements like "No Additives" and "No Pesticides" contributed significantly to increased purchase intent among younger shoppers,” said Hanagan-Muths. The new look will apply to the brand’s traditional grocery offering and club packaging formats. New labels will be shipping this January alongside a Q1 consumer media campaign.